On the Food Network, I saw a show where the host was using oxtails. She explained that "oxen are huge animals, so that's why they have so much meat on their tails." Ok, true, but the oxtails sold in butcher and supermarkets everywhere are harvested from cattle, not oxen. The husbandry of oxen is nearly nonexistent in this country today, and certainly not on any scale fit for mass-marketed meat production. 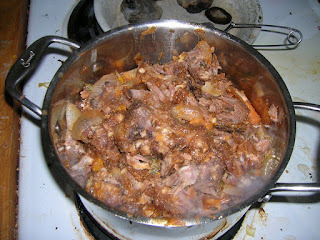 Cemented in my mood of mixed annoyance and "holier- than-thou" condescension, I decided to whip up a dish with oxtail. Oxtail are considered offal, even though they're skeletal muscle (just like steak! and hamburger!) and not an organ meat. I think this is just because of the general view of oxtails as a "scrap meat." As Carla summarized, "It's kind of weird to think about eating some thing's tail." But oh goodness are they delicious and richly beefy in flavor! The downside is that they take a long time to cook, since they're rife with collagen and sinew. The upside is that they basically make their own beef stock, as they have nubby little bones at their center to enrich any broth. And you can toss them in a low oven at lunch and forget about them until dinner. Then all the bones just fall right out. To match the rich flavor of the meat, I decided to cook them in a winy stock. Since there were so many segments of tail, I threw them all under the broiler to brown. This was a bit of a time saver, as I could sear them all in one batch while I got the braising liquid ready. I added one can of beef broth, 1/2 bottle of dry Cabernet Sauvignon, and 3 tablespoons of tomato paste, then allowed them to simmer away at 325 F for three hours. After that time, I added the veggies (onion, carrot, and celery, all roughly chopped to match the bulky nature of the oxtails) and kept cooking for another hour. In the last ten minutes of cooking, I added four cloves of chopped garlic and some black pepper. I find if I add garlic with the rest of the vegetables, its flavor gets cooked out by the end of cooking. Aside from your basic long noodles, all those fancy pasta pinwheels, spirals, and corkscrews are cut with a die. Most pasta on the market is cut with a plastic die, which is cheap, durable, and affordable. Plastic is perfectly smooth, a trait passed on to the pasta as well. When granny was rolling pasta out by hand with a wooden rolling pin on a well-worn wooden cutting board, the pasta took on the coarse texture of the unfinished wood. When dried, this gave the pasta a rough texture. In turn, this texture allowed the noodles to grip the sauce and hold more juicy marinara, bolognese, or alfredo on each bite. 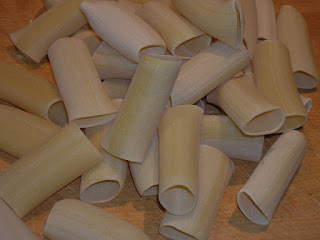 To mimic this coarse texture, some artisan pasta-makers use a brass die for their pasta. Since the brass is bored out with a drill, it leaves an unfinished surface that passes on the traditional texture to any dough that gets forced through. Long story short, that's what I used. To help brighten up the deep, cooked-down flavors of the meat, I added a small amount of fresh, pungent oregano to perk up the dish. 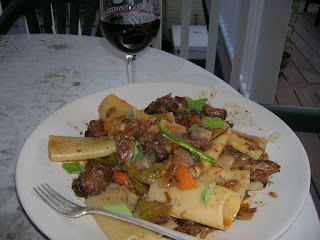 While more appropriate for a winter supper, this intensly flavored ragu turned into much more than the sum of its parts. On the palate the oxtails were winy, beefy, with crisscrossing tastes of herbal oregano, the hushed bite of garlic, and a light peppery finish. So maybe it's not such a bad thing to make such angst-inspired meals.